As the summer sun warms up, don’t forget to protect your fruit. If you try to make the most of space within your garden you may be tempted to grow espalier fruit trees like me. I have three apples that I grow in this way and this is the first year that they have had a decent crop on them. But because of the way that espaliered trees grow, fruit often doesn’t have the same degree of leaf cover that it would have on a normal tree. We have the dubious privilege of a 38oC day tomorrow, and have already had several days over 36oC. Unfortunately I wasn’t quick enough to protect the apple in the picture but I will be taking steps to protect them tomorrow to prevent any further damage. My preferred method of protection is draping one of my painting drop sheets over the tree and maybe fixing it to the fence with some tacks or drawing pins. 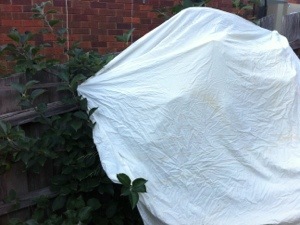 The light colour of the sheet helps reflect the heat so the tree doesn’t bake under the cover, and it is easy enough to remove when it cools down. How to prune – the fundamentals. It’s winter here in Melbourne at the moment and for many plants it’s the time of year to be pruning. 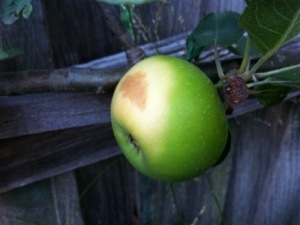 This is especially so in the fruit garden. However good pruning technique is essential to avoid the introduction of disease and to avoid dieback in stems. While I don’t claim to be an expert, I have put together a short video with what I have found to be essential information on how to prune. Hope it’s helpful! So did you find this useful? Anything else you would like to know? Write me a comment below and let me know, or share it with your friends. Choosing the right rootstock for your requirements will make your apple tree a welcome part of the garden rather than an nuisance. When choosing an apple tree for your garden you need to look at which rootstock you want it to grow on. All apple trees are grafted onto a rootstock. This means that the fruiting part of the tree at the top is attached to another part that forms the roots – the rootstock – through what is called a graft or join. This is done because apple trees do not grow true to type from seed. If you plant the seeds of an apple tree a new variety of apple will grow, most likely one that is small and not very nice to eat. 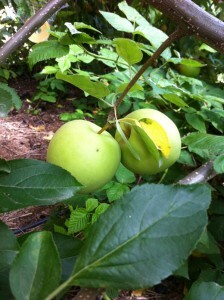 To ensure you get the apple variety you want, you take a cutting from an existing tree and graft that onto a rootstock. You could potentially take the cutting from the apple tree and stick it in the ground where it will likely take root and grow. However the use of certain rootstocks has developed. This is because the rootstock will often be from a variety of apple that is resistant to diseases and pest. This helps ensure the tree will be less likely to succumb to those pests and diseases. The Petty’s Orchard Open Day is happening again this year on Sunday 27th March. The annual event is run by the Heritage Fruits Society, which is a group dedicated to preserving rare and heritage breeds of fruits trees, i.e. preserving our genetic heritage. Unfortunately I don’t make it every year, but it is well worth the trip. One of the major bonuses I found was that they have a tasting of most of the heritage varieties of apples available in Melbourne. This is very helpful when it comes to deciding which varieties to have in your garden. I don’t see much point in growing the apple varieties that are widely available in the shops. By growing rare varieties you can have access to great tasting fruit that you would otherwise not get the chance to eat, and you are preserving the planet’s genetic heritage. As I understand it, proceeds from the event go to the Society.